Computer tomography (CT) is still the fastest and most robust technique to rule out ICH in acute stroke. However CT-sensitivity for detection of ischemic stroke in the hyperacute phase is still relatively low. Moreover the validity of pure clinical judgment is diminished by several stroke imitating diseases (mimics). The "Triage® Stroke Panel", a biochemical multimarker assay, detects Brain Natriuretic Peptide (BNP), D-Dimers (DD), Matrix-Metalloproteinase-9 (MMP-9), and S100B protein and promptly generates a Multimarkerindex of these values (MMX). This index has been licensed for diagnostic purposes as it might increase the validity of the clinical diagnosis to differentiate between stroke imitating diseases and true ischemic strokes. Our aim was to prove whether the panel is a reliable indicating device for the diagnosis of ischemic stroke in a time window of 6 h to fasten the pre- and intrahospital pathway to fibrinolysis. We investigated all consecutive patients admitted to our stroke unit during a time period of 5 months. Only patients with clinical investigation, blood sample collection and MRI within six hours from symptom onset were included. Values of biochemical markers were analyzed according to the results of diffusion weighted MR-imaging. In addition MMX-values in ischemic strokes were correlated with the TOAST-criteria. For statistical analysis the SAS Analyst software was used. Correlation coefficients were analyzed and comparison tests for two or more groups were performed. Statistical significance was assumed in case of p < 0.05. Finally a ROC-analysis was performed for the MMX-Index. In total 174 patients were included into this study (n = 100 strokes, n = 49 mimics, n = 25 transitoric ischemic attacks). In patients with ischemic strokes the mean NIHSS was 7.6 ± 6.2, while the mean DWI-lesion volume was 20.6 ml (range 186.9 to 4.2 ml). According to the MMX or the individual markers there was no statistically significant difference between the group of ischemic strokes and the group of mimics. 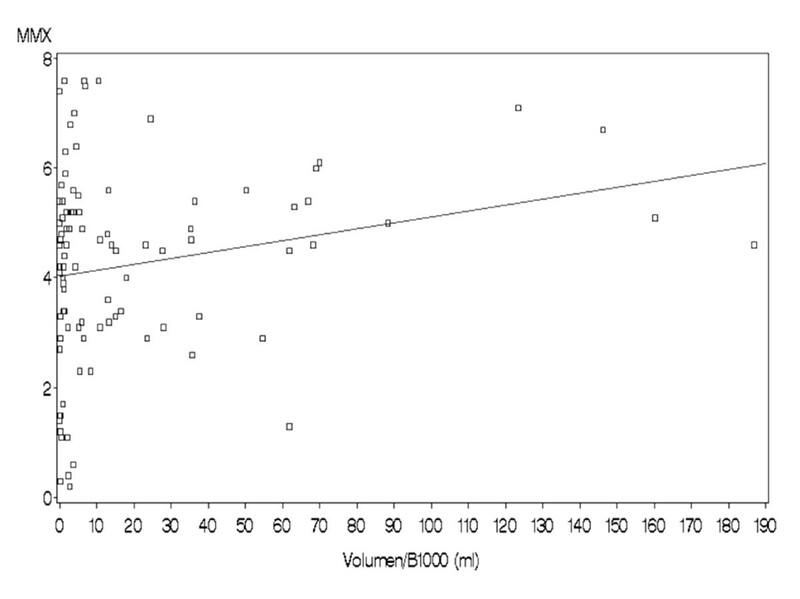 Moreover the correlation of the index and the DWI-lesion-volume was poor (p = 0.2). In our setting of acute MRI-proven ischemic stroke the used multimarker-assay (Triage® Stroke Panel) was not of diagnostic validity. We do not recommend to perform this assay as this might lead to a unjustified time delay. Stroke represents the 2nd leading cause of death and the most common cause of morbidity in industrialized countries. Although systemic fibrinolysis has been proven to be an effective therapy even in industrialized countries only the minority of all ischemic stroke patients receives rtPA therapy [1, 2]. Therefore, acute stroke therapy remains one of the essential challenges of Neurology. In case of acute stroke it's important to apply immediately reliable diagnostic tools to start treatment as soon as possible as the time to recanalization is a very substantial predictor of the clinical outcome . Acute stroke-imaging is still predominantly based on CT although detection of ischemic lesions at this time point is often difficult as early ischemic signs are only present in one third to one half of the cases . Even with sophisticated procedures like perfusion CT it is not possible to yield a higher sensitivity especially in case of non-territorial infarctions . In contrast MRI provides a very high sensitivity and specificity for detection of ischemic strokes even in the hyperacute stage [6–8]. However a comprehensive availability of MRI has not been achieved yet. Thus the diagnosis of ischemic stroke in most cases is still based on clinical estimation after ruling out intracerebral hemorrhage (ICH) by CT. However several other diseases like seizures or migraine make the correct diagnosis difficult. To enhance the clinical sensitivity and specificity several investigations on biochemical markers were performed. According to a significant increase of markers of inflammation, thrombosis and cellular death as well as myelin damage within 24 h from stroke onset a point-of-care immunoassay (Triage Stroke Panel®) has been developed. This system rapidly analyses Brain Natriuretic peptide (BNP), D-Dimers (DD), Matrix Metalloproteinase-9 (MMP-9) and S 100 B protein to estimate-together with a Multimarkerindex (MMX)-the probability of stroke. The aim of our investigation was to prove, whether this panel could enhance the diagnostic reliability and differentiate between ischemic stroke patients and patients with stroke imitating diseases (mimics). All patients consecutively admitted over a time period of 5 months to the stroke unit of the University Hospital of Ulm with the tentative diagnosis of an acute stroke were investigated. Patients were only included into the study if they were admitted in a maximum time frame of 6 h from symptom onset. Clinical investigation and collection of blood samples were performed immediately after admission. This procedure was directly followed by a typical standard MRI-based stroke imaging protocol (DWI, T2*w, TOF-MRA, FLAIR, T2w, T1w, PWI). Patients who did not receive a MRI, e.g. due to contraindications to magnetic resonance imaging or for technical reasons were not included. Finally patients were divided into three groups: group I consisted of ischemic stroke patients according to the judgment of the treating neurologist confirmed by a typical DWI-lesion. This group included also patients that were clinically classified as transitoric ischemic attack (TIA), but demonstrated an acute DWI-lesion correlating with the neurological deficit. In the absence of a typical DWI-lesion these patients were categorized in the classical way as TIA and included in group II. All other patients were included into the group III with patients with stroke imitating diseases (mimics). In group I the volume of the ischemic lesions was measured by determining the DWI-lesion size using an in-house developed volumetric software (TIFT). The analysis of the biochemical markers (BNP, D-Dimers, MMP-9, S 100 B, MMX) was done by Sandwich-Fluorescence-Immunoassay-Technology of the so-called Triage® Stroke Panel using blood from an EDTA sample taken within 15 min after admission. All stroke patients got the generally performed diagnostic investigations including sonography of the extracranial and intracranial arteries, ECG, long-term ECG and transthoracal echocardiography. Transoesophageal echocardiography was performed on an individual base. The TOAST classification was used to define the stroke etiology . Clinically the severity of the neurological deficit was assessed using the National Institute of Health Stroke Scale (NIHSS). Clinical development was evaluated by comparing the baseline NIHSS score ad admission with a repeated investigation measured 7 days after stroke or at discharge from the stroke unit. Statistics were performed by the SAS Analyst software. General characterization of patients was done by a descriptive analysis. The specifitity and sensitivity of the MMX as well as of the single parameters of the panel were calculated by comparing the results between group I and III performing a ROC -Analysis. To rule out any uncertainty we excluded the TIA group from this analysis. In addition the results of the biochemical markers in the stroke group were correlated with the size of the respective acute DWI-restrictions in the MRI. For the correlation analysis Spearman correlation coefficients (p) and scatter plots were used. For pointing out differences between groups we performed the Fisher exact test (2 variables) and χ 2-test (> 2 variables) for non-continuous variables and the Wilcoxon- (2 variables) and Kruskal-Wallis-Test (> 2 variables) for continuous variables. Statistical significance was assumed in case of p < 0.05. Finally a ROC-analysis was performed for the MMX-Index. The ethics committee of the University of ULM approved the study. Written informed consent was obtained by all included patients or their legal guardian. In total 174 patients were included. The cohort consisted of 100 ischemic stroke patients (group I) with a median age of 73 years (range 18-97 years), 25 patients with TIAs (group II) with a median age of 74 years (range 40-88 years) and 49 mimics patients (group III) with a median age of 65 years (range 22-93 years). Demographic as well as clinical characteristics of patients are shown in Table 1. Beside a higher incidence of atrial fibrillation in the group of ischemic stroke patients there were no significant differences between the three groups in terms of demographic characteristics and vascular risk factors. Admission after the first symptoms was within 1 h in 9% of the patients, between 1 h and 3 h in 56% and after 3 up to 6 h in 35% of all patients. The mean admission time was 3.03 ± 1.74 h after the first symptoms. Patients in the mimics group were suffering from migraine with aura (n = 4), other types of headache (n = 3), seizures with concomitant postictual paresis (n = 12), dizziness (n = 7), syncopes (n = 8), hypertensive encephalopathy (n = 1), idiopathic paresis of the facial nerve (n = 1), transient global amnesia (n = 2) and other diagnosis (n = 11). According to the TOAST-criteria 35% of the ischemic stroke patients suffered from cardio-embolic strokes, 39% from stroke of thrombembolic origin and only 3% were judged to have microangiopathic strokes. In 4% other, rare causes of stroke have been found, while in 19% the origin of the stroke remained unclear or was possibly due to more than one single cause. 76% of the ischemic strokes were localized in the anterior circulation territory (70% in MCA territory) and 23% in the vertebrobasilar territory (10% in PCA territory, 10% in the brain stem, 10% in the PICA territory). We quantified the acute lesion size by an in-house developed software measuring the acute DWI-lesion size on admission, which means immediately after collecting the blood sample for the biochemical analysis. The mean lesion size was 20.6 ml ranging from 4.2 to 186.9 ml. Clinically the mean NIHSS was 6 (median; range 0-25) at admission and 4 (median; range 0-19) at discharge. There was a significant correlation of the ischemic lesion size and the clinical presentation of strokes on admission as well as 7 days later (or at discharge) (Spearman's p = 0.57 and p = 0.47 respectively). The triage stroke panel measures BNP, DD, MMP-9, S100 B and generates the Multimarkerindex of these values (MMX). In our investigation this index did not differ statistically significantly between the both groups of mimics and strokes (mean 4.2 ± 1.7 vs. 3.6 ± 2.0, n.s.). Moreover not even a modest correlation was found between the DWI-lesion size and the MMX-value (p = 0.2, see Figure 1: Comparison of the DWI-lesion size and the MMX-values. No significant correlation was obtained). According the time window from symptom onset MMX did not differ statistically significant between a time frame of 3 h and 6 h from symptom onset (median 4,5 and 4,6; n.s.). Comparison of the DWI-lesion size and the MMX-values. No significant correlation was obtained. Consequently the ROC analysis for MMX showed a low discriminatory power with an AUC-value of 0.59 (see Figure 2: ROC-Analysis of the MMX-Value with a poor AUC-Value of 0,59). ROC-Analysis of the MMX-Value with a poor AUC-Value of 0,59. Median of the MMX and its individual Markers in the stroke and mimics group. Further subgroup analysis yielded a strong significant trend (p = 0,002) with higher BNP-values in case of cardioembolic stroke according to the TOAST classification compared to other stroke etiologies (median 131 vs. 19,8). When we excluded patients with a supposed cardiogenic etiology from the stroke group, the difference between the other TOAST-groups to the mimics in terms of BNP did not longer stay significant. 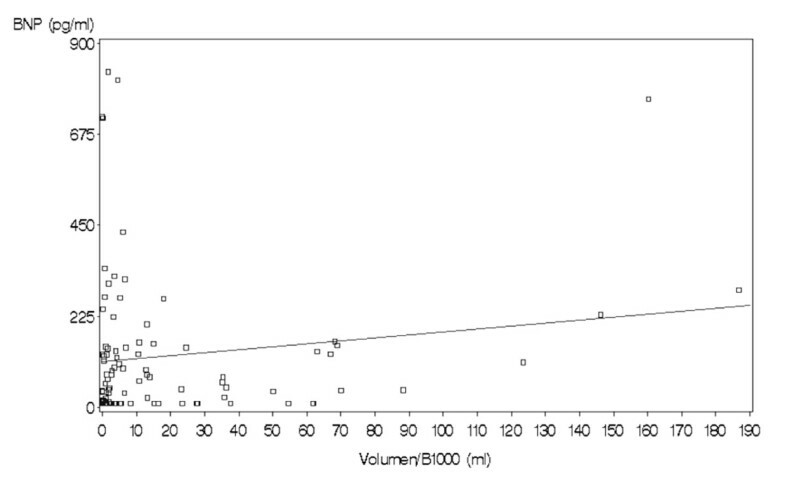 In addition, we didn't find a strong correlation with the DWI-lesion volume neither for the BNP-values nor for any other biochemical marker (p = 0,09, see Figure 3: Comparison of the DWI-lesion size and the BNP-values. No significant correlation was obtained). Comparison of the DWI-lesion size and the BNP-values. No significant correlation was obtained. An early and valid diagnosis expedites the way to fibrinolysis in ischemic stroke and excludes stroke imitating diseases from the potentially dangerous therapeutic intervention. To improve the reliability of the clinical diagnosis the Triage® Stroke Panel has been developed. A recent investigation proved whether this multimarker assay could increase the diagnostic sensitivity of a clinical prehospital stroke scale in-between the first 24 h after the initial symptoms . We wanted to prove the diagnostic sensitivity and specificity of this test solely in the therapeutically relevant time window up to six hours. To exclude any clinical uncertainty we compared the biomarker index as well as its individual parameters with the MRI results of ischemic stroke patients and stroke imitating diseases. In case of acute DWI-lesions patients clinically rated as TIAs were classified as ischemic strokes according to their greater risk of recurrent cerebrovascular events . The group of TIA patients without DWI-lesions was not included in the statistical calculation of sensitivity and specificity in order to rule out any diagnostic uncertainty. Furthermore to avoid any selection bias patients were included consequently after the admission to our hospital. 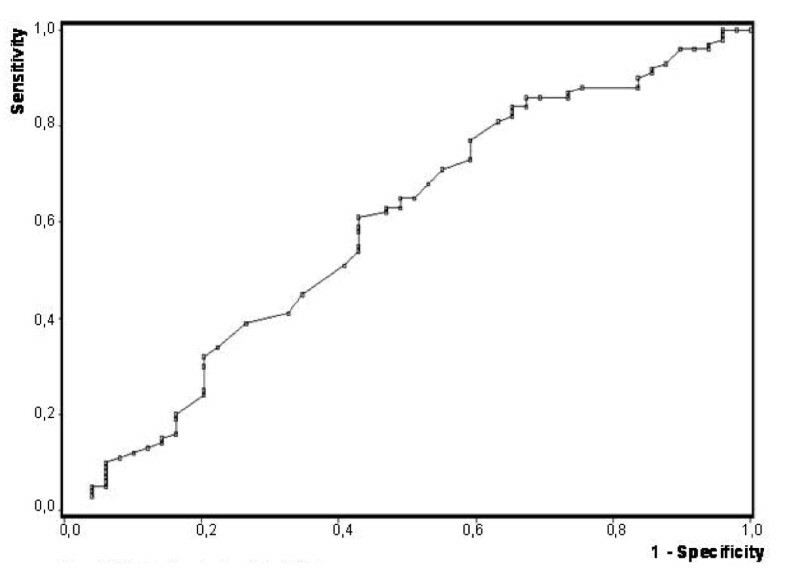 The group of ischemic strokes consisted of a quite common spectrum of older patients with typical stroke patterns, e.g. stroke of the anterior circulation of mostly thromboembolic origin. The only demographic difference was a higher proportion of patients with atrial fibrillation in the group of ischemic strokes compared to the group of TIA's and mimics. Consistently according to the TOAST-criteria the treating physicians estimated a percentage of cardiogenic strokes higher than usual, while only a few strokes were judged as small vessel disease. The latter is possibly due to the short time window and the tendency to later admissions of lacunar strokes with minor clinical deficits . In contrast to earlier investigations [10, 13, 14] in our cohort the multimarker-index or its individual items were not able to differentiate between the groups of ischemic strokes and mimics. This is possibly due to several reasons. First in our cohort ischemic stroke was diagnosed according to a combination of the clinical judgment and MR-imaging, which is clearly superior to a diagnosis based on pure clinical judgment or on a combination of clinical judgment and CT-imaging. This is especially true in case of smaller ischemic lesions with clinical syndromes that do not directly give direction to the correct diagnosis. Therefore based on MRI we possibly included patients who otherwise would not have been classified as ischemic stroke. In contrast so called MRI-negative ischemic strokes might led to the exclusion of patients which would have been classified as ischemic stroke based upon clinical judgment. However neither the imaging parameters of our patients nor the clinical severity of disease give rise to suchlike considerations. Both the DWI-lesion size [15, 16] as well as the mean NIHSS on admission  were quite comparable to other investigations. The one rather critical difference certainly is the narrow time window, as we only included patients up to 6 h after the onset of the first symptoms. Although a lot of biomarkers have been shown to rise after an ischemic stroke, most of them increase with a considerably longer delay. While S 100 B seems to peak after more than one day , MMP 9 seems to rise within the first eight hours after stroke reaching its maximum after 24 h . This lag of time explains the missing difference between the group of ischemic strokes and stroke imitating diseases for S100 B and MMP-9 in our cohort most likely. The solely marker significantly heightened in the ischemic stroke population compared to the mimics group at this early time point was BNP. However this effect was caused by the patients assumedly suffering from cardiogenic stroke. These results are in concordance with several other investigations, which demonstrated an augmented expression of BNP predominantly in stroke of cardiac origin [19, 20], while other etiologies did not necessarily demonstrate this elevation [21–23]. Moreover there was no correlation between these single parameters (or the MMX-value) and the ischemic lesion size measured by the acute DWI-lesion volume. Although there are several reports about shrinking DWI-deficits, DWI-lesions at least approximately represent the infarct core . From a pathophysiological point of view a biomarker for identifying ischemic strokes should depend on the amount of irreversible damaged brain tissue. One candidate marker indicating neuronal destruction would be NSE (Neuronspecific Enolase) [25, 26]. As we missed to demonstrate a suchlike relationship and the MMX Cut -off points reached only a weak and clinically not reasonably sensitivity and specificity we couldn't demonstrate a general diagnostic value for the investigated biochemical markers in our setting of hyperacute ischemic stroke. Neither one marker nor combination of all markers is of significant benefit in acute stroke diagnostics. DWI-MRI is still the procedure with the highest diagnostic quality in case of acute cerebral ischemia. Nevertheless further investigation of biochemical markers might lead to higher diagnostic quality in acute stroke diagnosis, e.g. in the differentiation of etiological subgroups. CK was involved in composing the study design, the data collection, statistical analysis and in drafting the manuscript. KK contributed to the interpretation of the results and to the critical revision of the article. SM contributed to the revision of the manuscript. ACL contributed to the critical discussion of the study design and concept and revision of the article. DB contributed to the revision of the manuscript. HPM developed the volumetric software (TIFT). RH was involved in the conception of the study design, the interpretation of the results and in drafting the manuscript. All authors read and approved the final manuscript.